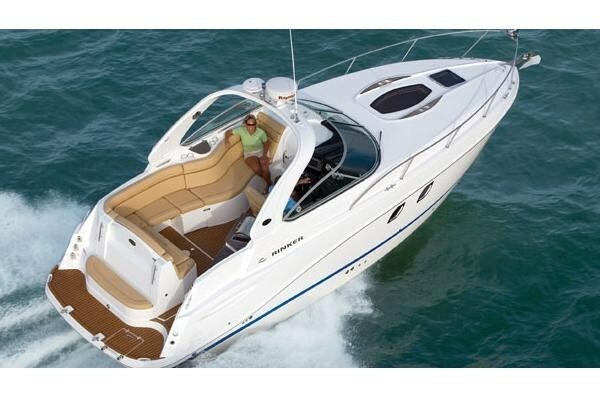 The 310 EC (Express Cruiser), brand new for 2010, is one of six models in this series from almost twenty-nine to over forty-one feet in length. It is loaded with standard features and is available with either twin MerCruiser (with Digital Throttle and Shift Controls) or Volvo Penta (with Electronic Vessel Controls) sterndrive power and with available joystick control. First on the outside. Standard equipment includes a radar arch, power anchor windlass with line, chain, and roller, remote spotlight, swim platform with integrated boarding ladder plus unique pull-up cleats for an optional Walker Bay RIB dinghy and motor, plus not only the normal foredeck opening hatch, but also a huge foredeck skylight with built-in privacy shade screen. The cockpit offers unique lounge seating which extends the entire length from the cabin bulkhead along the port side to the transom and then across the transom. A center pull-out section adds extra seating flexibility around the standard, stowable table. The transom section of this lounge flips down for an aft sunlounger above the transom “rumble” seat. A cockpit wet bar with built-in blender is standard. Refrigerator or ice maker is optional. An acrylic bimini top with camper canvas is standard. The helm seat is double-wide and swivels to face cockpit guests while the helm itself includes not only the standard array of gauges, but also a digital depth gauge, engine synchronizer, VHF radio, and controls for trim tabs with LED indicators, remote anchor windlass, automatic fire suppression, and a stereo remote, all standard, as is a transom stereo remote. A sliding, screened cabin door provides access below to six-foot, four-inches of cabin headroom. A full-size convertible custom couch to port with stowable dinette table faces a well-equipped galley with Corian® top, stainless steel-fronted refrigerator/freezer, stove, and microwave. Standard cherry or optional high gloss maple cabinetry complements four choices of interior designer fabric packages. Two steps assist access up to the forward berth. A flatscreen TV/DVD is optional in the mid(aft)-cabin but standard in the main cabin. Generator, stainless steel safe, cockpit grill, foredeck sunpad, and AC/heat are notable available options.